By the time I got to Niamey, I'd run out of cash - it turns out there aren't many banks or American Express offices in the desert. Funny, huh? So, I had to sell the radio I bought in Guinea Bissau (to replace the one stolen in Morocco) for fifty bucks in order to pay for bus fare and the visa to get to Benin in order to get to Togo so I could get to an American Express office for more traveler's checks. Which probably would have been fine, since I hadn't planned on staying long in Niger. Then, I went to the bus station. It's so different, it's hard to explain properly. You see, there's a dirt lot on the edge of town that's easily two or three square miles, filled with vehicles of every imaginable shape and kind going everywhere in Africa. And believe me, there's no map or plan about where to find your bus (or car, or..). So, you wander and ask until you find someone who knows where the vehicle you want might be - this only takes a few hours. Then you ask - "when does it leave?" "Today at three," you're told - great. So, I plunk down all but my last 10 dollars on a ticket, and sit down on a stump. Did I mention that there are no buildings? Tree stumps comprise the lounge, and tin shacks the offices (if they're, you know, big time). Well the bus doesn't leave at three. Or four. Or five. About six, they "announce" that now, the bus will be leaving tomorrow at three, but that we should arrive at ten, in case it leaves earlier. This is so par for the course at this point, that I don't give it much thought. I'm just worried about where I'm going to stay - not much money left (even though the "hotel" is only $2 / night). 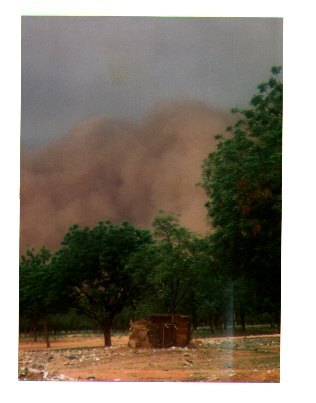 After 2 days in the bus station, a sandstorm rolled in off the desert - it took less than 2 minutes to go from a dark line on the horizon to a wall of sand and dust a kilometer high. Everyone ran frantically to get inside anything - you could easily choke, and the wind is probably gusting 50 mph - it really stings. That little structure is the bathroom. On the third day, those of us who've paid and waited are able to determine that a) there are no other buses; b) we are very definitely not getting a refund; c) we ain't leavin' until they've sold all 90 seats on the bus. Took four days. I made it across the border 15 minutes before my visa expired. It took another 2 full days to drive about 300 miles to Togo. During that time, we broke down several times, and at least once, stopped for 4 hours at the driver's girlfriend's house. Yes really. All while driving on a bus filled to twice capacity - and if you're thinking air-conditioning, think again. Worse, the windows were often up to keep the dust out.